We’ve laid the foundation to build your branding strategy in a previous post. Now, let’s talk about your competitive position, which in a nutshell is your differentiation in the market. Now, I could bore you with a bunch of technical marketing jargon, but that’s what you’d hire a marketing pro for. Instead, here’s an easy to use quick version in lamens terms so you can begin to create your differentiator to establish your position in the market. Answering these questions will put you on the right track! Develop a market profile as related to your niche. For example, I’m a marketing strategist for small businesses in xyz industries, and I’m based in Atlanta, GA. So, I may start with finding out how many small businesses in xyz industries there are in Atlanta, how many years they’ve been in business, their growth rates, key decision makers, and publicized new projects. How do your clients find you and your competitors? Are they using Google search? Are they looking through print ads? Do they issue requests for proposals? Seek out professional associations for referrals? Are they searching social media? Different industries use different tactics to find resources, so first and foremost you must learn how your industry operates. Ask what your client needs and wants. It’s easy to sit and think about what you think your client needs. But, did you ask them? Ideally, you want to get out in the market and find out what keeps your prospective clients up at night. Do this via informational interviews with prospects and q&a with your existing clients. Hint: If you can help your client solve a problem, alleviate a burden, and get back to focusing on their responsibilities, you’re on your way to getting hired! 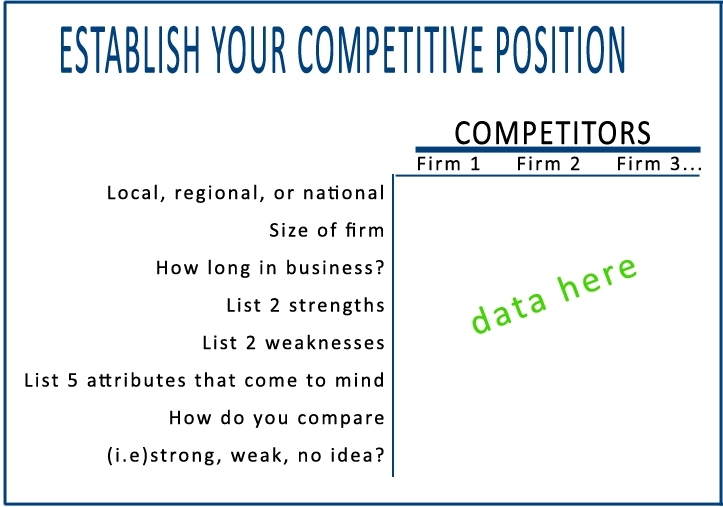 Identify your competitors’ weak spots. If you can find opportunities that your competitors are not taking advantage of, you may have found a goldmine to exploit! What is your value to the market? Is your product the absolute best out there in terms of benefits? Do you provide a competitive solution to a challenge with a focus on client-service? Are you a convenient option? Your answer to this question is the foundation of your BRAND. There are no shortcuts! If you think you can skip a couple of steps because you think you know most of the answers, you are more than likely mistaken unless you develop marketing strategies for a living. Great brands don’t just happen, they are cultivated over time. Spending time understanding your competitive position will help you with your sales pitch, newsletter copy, e-blasts, web verbiage, etc. Once you finish this analysis, you will be able to assess your competitive position, your competitive advantages, and you’ll have an understanding of what your clients need and want. You can further develop your branding strategy based on your clients’ needs, putting you one step closer to getting hired! Miss Kemya is a Marketing Strategist & Social Media Manager at Phisco Marketing, a marketing consulting firm that facilitates the growth of small businesses through conventional marketing techniques merged with social media tactics. When DIY marketing doesn’t get the job done, hire Phisco Marketing to revitalize your marketing strategy and fall back in love with your business!